Equine Experience can incorporate a variety of ground work ( NO RIDING OR EXPERIENCE OF HORSES REQUIRED ) and general horse-related activities such as grooming, leading, and herd observation. ​Why Is The Horse Such a Valuable Partner in Personal Development? The horse is increasingly recognized as a partner in exploring positive development of communication, self respect, confidence, trust, accountability, and conflict resolution. ​Like people, horses are social beings whose herd dynamics are remarkably similar to the systems of human family and human society. Equine Experience invites experiencing change in a hands-on way by challenging people to look at themselves and the world in a new way. ​Research has confirmed the effectiveness of therapeutic equine activities, showing that it lowers blood pressure and heart rate, alleviates stress, and reduces symptoms of anxiety and depression. ​How Can Working With A Horse Benefit Me ? Many people struggling with addictions, trauma and other issues have learned that "feeling" is painful. One of the first steps is learning to identify, experience and cope with emotions without trying to escape into negative habits and patterns. ​Equine experience is a powerful way to get in touch with thoughts and feelings. Horses have a great ability to sense emotions and react accordingly. If someone is angry or aggressive, the horse may become obstinate or fearful. If the person is anxious, the horse may become nervous and anxious also. However, when approached by someone who is open and calm, the horse is more likely to respond in kind. Observing the horse’s response promotes self-awareness and can help people see themselves in a more realistic way. For those individuals who find it challenging to relate or become close to other people, establishing a bond with a horse can be a step forward in the way in which they relate to other people. 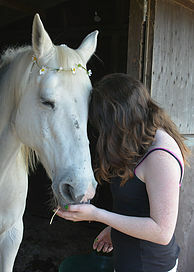 .Through working with horses, people recognize their conscious and unconscious patterns of interacting with others. Horses do not speak, but they are excellent communicators. Learning to understand horse behavior can help people learn how others function in the world and the way their behavior impacts others. ​Exercises as simple as haltering, leading and grooming encourage people how to approach others with awareness and respect - the basis for building trust and communication. Without any words at all, horses make clear when someone has crossed their boundaries. Similarly, being extremely detached or passive can make it difficult to lead a horse and will deter the horse from complying with a request. Evaluation of the horse's response can reveal a great deal about how people unknowingly set - or fail to set - boundaries with others and that awareness can lead to changes in behaviour that make establishing personal boundaries far more effective. ​In a safe environment, clients learn to face concerns and build confidence in their ability to overcome challenges. People who are intimidated and nervous at first may be surprised to discover how quickly they can process those feelings and find comfort in their relationship with the horse. Empowered by the experience, people may develop the confidence to address other fears and transfer these lessons to day-to-day life. Horses are straightforward in their interactions without lying or manipulating. They do not judge or blame. Their presence alone can be immensely healing. When a client finds they are able to build a co-operative relationship with a horse and the horse develops trust in them, they can begin to use this experience as a foundation to trust themselves and then to trust others also. Horses are great keepers of confidence and simply talking to a horse about the cares and concerns of the day while grooming, for example, can help to unburden a person considerably. These five areas mentioned above are just a few instances of the growth that happens through equine activities. Accepting responsibility, taking care of oneself and others, patience, humility, a sense of pride, and an appreciation for the simple joys in life all contribute to the process of change. ​Activities With Horses Offer All This And The Benefits Of Being Outdoors And Active. No Riding Involved And No Experience Necessary. All Horses Insured.